The long selling all-in-one portable turntable, handy trax, has been upgraded with a USB connection and now enables listeners to transfer vinyl to your computer. Recapturing the freedom of music, the handy trax USB, with its anytime, anywhere portability allows vinyl enthusiasts to leisurely pursue their interest in analog purity with the confidence of Vestax quality. Whether a collector from fine Jazz to classics, a digger in search at garage sales or in the attic the handy trax USB will take you wherever possible. 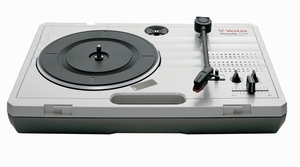 from Japan to the Americas, through Europe and back, Vestax assures infinite portability. *The handy trax USB can be battery powered and comes with a built-in compact & high spec mono speaker, which lets you listen to vinyl whenever and wherever you like. * Pitch control and tone control dials. * Line in, line out and headphone out. *Tri speed playablility. 33 1/3, 45, and 78 rpm. *USB output for transferring vinyl to your computer. *Easy to use ripping software [EZ-ROK] included. Saves vinyl to your computer in WAV, OGG, FLACS, AIFF, MP3 and other formats.